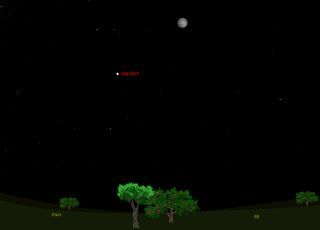 This sky map shows where the moon will appear on Tuesday, Oct. 11, 2011 during the smallest full moon of 2011. Jupiter will also be shining extremely bright nearby. In my more than 40 years as an amateur astronomer, I've given countless numbers of people views of a variety of celestial objects through telescopes. And most people usually will tell me that the first object in the sky that attracted their attention as youngsters was the ever-changing moon. Many may recall the attention given to our nearest neighbor in space in March when that months' full moon very nearly coincided with the lunar perigee — the point in the moon's orbit in which it is nearest to Earth. At a distance of 221,565 miles (356,575 kilometers), some media outlets even christened it the "Supermoon" of 2011 because of its unusual closeness. But on Tuesday night (Oct. 11) we will have the astronomical opposite of a supermoon. At 10:06 p.m. EDT (0206 GMT), the moon will officially turn full, but it will be the smallest full moon of 2011. The sky map of the smallest full moon of the year shows where it will appear on Tuesday night when it reaches its full phase. Looking at the moon during Tuesday night, perhaps you will be struck by the noticeably small size of the moon's disk, even when it's near the horizon (which is supposed to make it appear larger as a result of the familiar "moon illusion" effect). Last March, when the full moon was at perigee, some reported it as looking absolutely enormous as it emerged from above the eastern horizon. Not so on Tuesday, however, because the moon will very close to apogee, making this the smallest full moon of 2011. By coincidence, October's full moon comes just days after the second annual International Observe the Moon Night on Oct. 8, in which skywatchers participated in hundreds of lunar observing events at skywatching parties around the world. In fact, it will appear 12.3 percent smaller than the so-called supermoon of March 2011. And because it is near its maximum distance from the Earth when full, the moon will also be traveling relatively slowly in its orbit. So both effects will combine to make its motion against the background stars especially small from night to night. As a result, to the casual skywatcher it will seem that the moon is full for not just one night, but for three nights in a row: Monday, Tuesday and Wednesday. The defect of illumination on the moon's disk — or put another way, the dark sliver near the edge — will be very slight on Monday and Wednesday night. It's due, of course, to the fact that the moon travels around the Earth in an elliptical orbit, but the moon’s orbit is not fixed relative to the earth, but is changing continually, owing chiefly to the unequal effects of the sun’s attraction for the moon and Earth. So the moon's orbit skews or rotates eastward in a period of a little less than nine years. The moon appears to go from one full moon to the next over a period of 29.53 days, known as a "synodic month." But the time that the moon goes from one perigee to the next is equal to 27.55 days, known as the "anomalistic month." So if a full moon coincides with perigee (as was the case last March), the following month perigee will take place about two days earlier in the calendar relative to the full moon. And about a half year later, the full moon will be nearly coinciding with its farthest point in space relative to Earth — apogee — which is what it will do on Tuesday night. And yes, as you might have guessed, two weeks after our not-so-super October full moon, the new moon of Oct. 26 will coincide with perigee. Of course, you won't be able to see the new moon because of its close proximity to the sun in the sky, but as was the case with the full moon in March, ocean tides will be more extreme for a few days around that time because of the lineup of the sun, Earth and moon, plus the fact that the moon will also be near its closest point to the Earth.